Helms are common nautical motif. Nautical table runners appear in homes of all sizes, from small family units to opulent mansions. The historical significance of maritime symbolism has given table runners, placemats and other decorative linens bearing these icons a fresh burst of popularity in the home décor industry. Table runners are narrow strips of cloth long enough to drape stylishly across the center of a table lengthwise. While runners don't cover an entire table, people use them like tablecloths either to decorate their tables or to protect them from serving bowl or platter heat and food stains. Using a table runner to accent a full-sized tablecloth for an extra touch of elegance and texture remains one of the most popular uses. Many people like to layer a variety of table runners in coordinating colors and fabrics to add a dimension of depth and opulence to their place settings. Runners also help to dress-up occasional tables, coffee tables and end tables. Runners come in an inviting array of fabrics, colors and sizes, while often featuring patterns like nautical iconology to help unify the theme of a room or event. The allure of adding a touch of the sea to home décor lies perhaps in the enduring tools seamen employ to navigate her mysterious depths. Toss in a splash of style with rich textiles or well-placed embellishments and a home decorating statement comes alive. 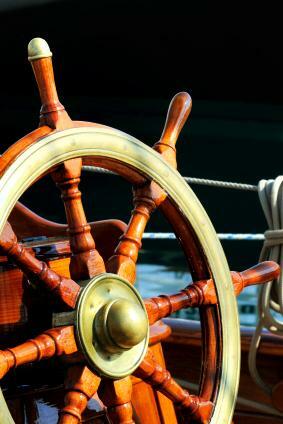 The importance of maritime history with regard to exploration, settlement and food provisioning has brought about a profusion of nautical symbolism over the centuries. People are drawn to maritime table runners and placemats with designs like the ones listed below because they live near the sea, have a family business based on seamanship, are planning a nautical-themed party or are simply interested in marine life and symbolism. Most nautical table runners are presented in sea-colored hues such as deep blue, midnight black or sea green, however, a paler shade may serve to highlight the accompanying marine symbols more clearly. The choice of fabric depends upon personal taste, but sturdy, textured materials like woven-cotton blends, chunky velvets and silk taffetas better emulate choppy ocean waves. Fringe, tassels and embroidery trim can bring an elegant finishing touch to all types of table linens. You can purchase premade table runners created in beautiful maritime themes. To add a personal touch and an element of creativity, you may choose to make your own table runner using one of several methods. The best way to sew a new table runner is by using a pattern, especially if sewing is a new skill. You can find patterns in craft shops, fabric stores or even in department stores, although you may have to design your own nautical embellishments. If you can't find a pattern you like, the simple shape of table runners are relatively easy to sew on your own and maritime accents can be added once the basic runner is completed. You can find step-by-step instructions on sewing your own table runners at many craft and sewing sites. The links below provide instructions for sewing or quilting table runners. Adding nautical embellishments to a plain table runner is probably the easiest way to craft your own design. If you're handy with a skein of embroidery thread and a needle, choose a solid-colored damask or cotton runner for applying your own marine accents in thread with contrasting colors. For those who would rather not sew, look for iron-on transfers or try drawing the nautical designs with fabric markers or inks. Whether you need nautical table runners for a one-time-use or to plan to use it often, make the most of your choices by selecting symbols that may work well for a variety of occasions. Reversible fabrics, ambiguous patterns and colors that coordinate well with your décor can extend the life of a simple table runner into infinity.